DVDFab YouTube to MP3 software is a handy YouTube MP3 converter. It allows music fans to convert YouTube videos to MP3 tracks saved on computer HDDs, with just one click or two. This means, after transferring the converted MP3 audio files to your device, be it a smart phone, classic iPod music player, or even a smart watch, you can take your favorite YouTube songs everywhere. No longer need the YouTube application, and no longer need to stream, either. Simply paste the URLs of your favorite YouTube videos into this DVDFab YouTube to MP3 converter. You can convert any music videos to 320kbps high quality MP3 files that are compatible on extremely portable devices. Such as an iPod Shuffle, an iPod Nano, even an Apple Watch, or an Android Watch. So you can enjoy your favorite YouTube songs anytime while you are doing the laundry, jogging, cycling, or even swimming. What’s more, this DVDFab utility is totally free for you to download single videos one by one. To one or just a couple of videos, copying and pasting each URL to download and convert won’t cost you too much of time. However, if it’s an entire playlist which contains dozens of songs, copying and pasting the URL one by one to download won’t be a pleasant experience at all. But don’t worry! If the URL is recognized as a playlist after being analyzed, the Pro version of this YouTube MP3 converter software will give you the extra option to download and convert all the videos under that playlist at one go. In this way, you can get all the songs in a playlist with no sweat. When downloading videos from YouTube, the metadata information, including the cover art, artist, title and others, will also be downloaded. What’s more, after being converted to MP3 files, the metadata information can be retained. This is to say, when playing back the MP3 files on compatible devices, all the information will be displayed. The download of one video may cost you only a couple of minutes. But imagine an entire playlist that contains dozens of videos, or if you have several playlists to be downloaded, that would require quite a while. This is when and where the VIP Speed Download feature can help a lot. Once the VIP Speed is turned on, the download and conversion process can be 2X faster. This means, to download and convert an entire playlist won’t keep you waiting too long. By default, this DVDFab YouTube to MP3 converter can process one download thread at a time. This means, even you’ve pasted several URLs each containing one video or a playlist, only one task can be processed, with others waiting in the queue. But if don’t want to wait, you can enable the Multi-Thread Download feature (available only to the Pro version) to process several download threads simultaneously, with an upper limit of 5 threads at most. New: Added the support for some new Java protections. New: Added the support to remove the Cinavia watermark as found on the US version of 4K Ultra HD Blu-ray Resident Evil: The Final Chapter (2016). New: Added the new conversion profiles for some major Huawei smart phones including the Mate X/20/10 series, P20 series, Nova series and more in the Ripper and Converter modules. New: Added the support to delete the finished tasks without the need of a program restart. New: Improved the Video Downloader utility tool. Fix: A crash problem when clearing history in certain cases. Supported Operating Systems: Windows 7, 8, 8.1, 10 (32-bit, 64-bit). 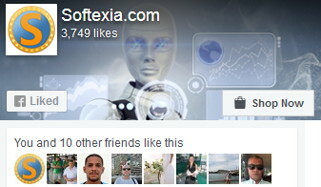 Softexia.com is a Mac, Linux, Android, iOS, Web Cloud and Windows software publishing website that provides free downloads, daily software updates and sales for trending software with discounts, coupon codes and other promos.